Background: The new T1 pancreatic cancer by the 8th edition AJCC staging system discards the concept of "extension beyond the pancreas"? and focuses on size only. Also, the new T1 is divided into T1a, T1b, and T1c based on size. As the T1 pancreatic cancer is very rare, the feasibility of these changes has not been evaluated. The aim was to evaluate the feasibility of the new T1 definition in the pancreas head cancer cohort. Methods: Data of 540 patients that underwent surgery with curative intent in 3 tertiary referral centers for T1 pancreatic ductal adenocarcinoma defined by the 8th edition were collected from Korea (n=86), Japan (n=118), and the USA (n=336). The participating centers have multidisciplinary pancreatology specialists and are representative institutions of each nation. Invasive IPMNs and those who received neoadjuvant treatment were excluded. Demographics, operative, pathologic features and survival data were collected. Clinicopathologic features were examined and survival analyses were performed. Results: Of the 540 patients, 181 patients were T1 by the 7th edition and 359 were down-staged to T1 from the former T3 because the concept of "extension beyond the pancreas"? have been discarded. R0 was achieved in 82.0%, R1 in 17.4%, and R2 in 0.6%. Despite being T1 cancer, lymph node metastasis was found in 53.0% and 17.8% had more than 4 metastatic lymph nodes. Further, distant metastasis was found during the surgery in 7 cases (1.3%). The 5-year survival rate and the median survival of T1 patients were 30.6% and 27 months, respectively. 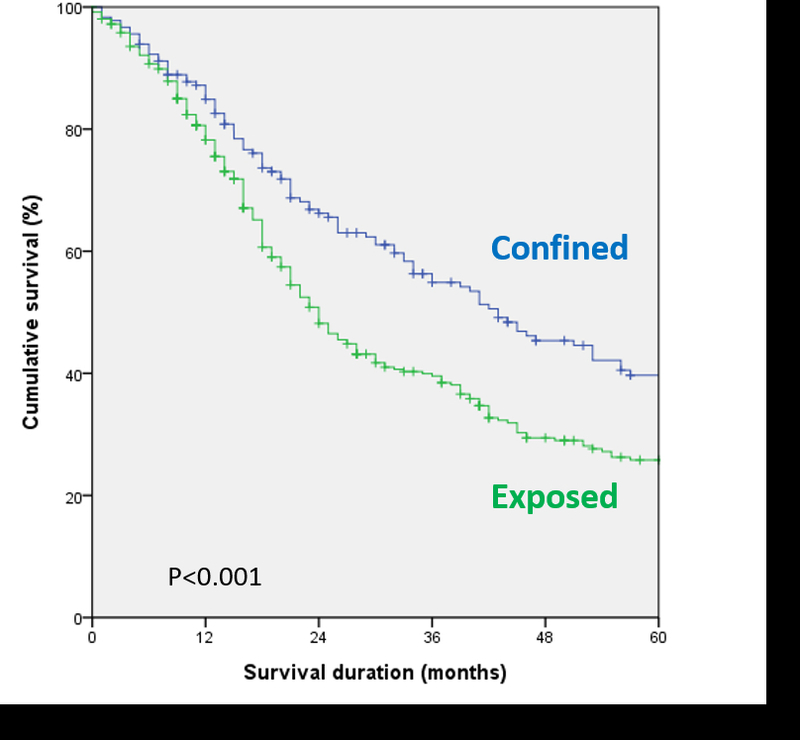 Comparing tumors that extend beyond the pancreas (new T1) and those confined within the pancreas (original T1), the latter showed significantly longer median survival (43 vs. 24 months, p<0.001). The 5-year survival rates were 39.7% for the original T1 and 25.8% for the new T1 implying the prognostic significance of extrapancreatic extension in pancreatic cancer. 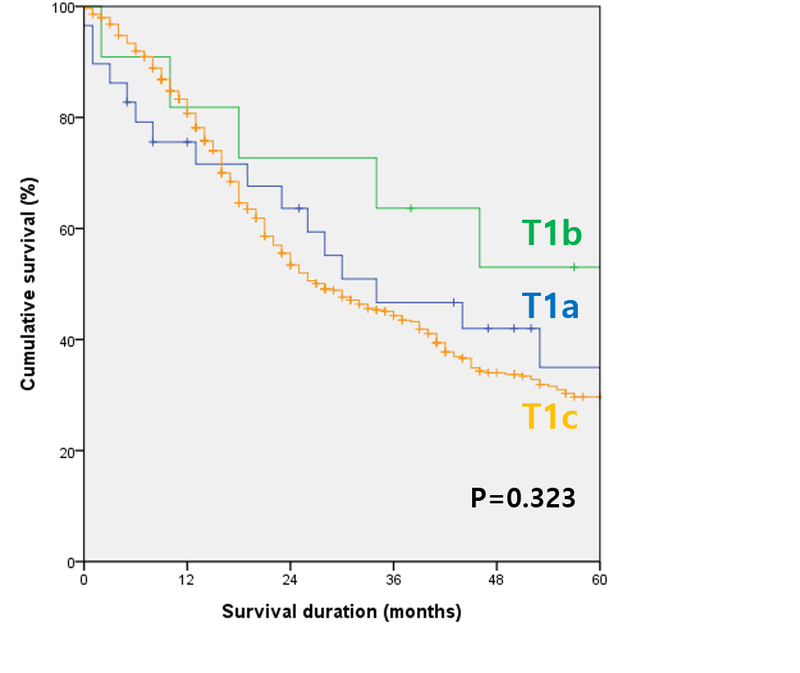 The median survival of T1a, T1b, T1c were 30, 46, 27 months, respectively. There were no significant differences in survival (p=0.323). Furthermore, T1b demonstrated better survival outcome than T1a. Using max-stat, subcategorizing into 3 groups was not valid. On the other hand, subdividing into 2 groups using 1.1 cm as the cut-off value yielded significantly discrete prognostic groups (p<0.001). The new T1a had median survival of 53 months and the new T1b 26 months. Conclusion: The new T1 definition may be more practical, but the implication of the concept of "extension beyond the pancreas"? should be re-investigated. Further, the subcategorization of T1a/b/c does not seem to be adequate. New and more feasible subcategorization needs to be explored. As the incidence of T1 pancreatic cancer will inevitably increase in the future, acquiring in-depth understanding and knowledge of T1 pancreatic cancer is important. The significance of extrapancreatic extension in T1 pancreatic cancer is demonstrated. The survival curves of subcategorized T1 pancreatic cancer illustrate its inadequacy.